I am very fortunate to be working with Troy Hicks and colleagues from the Columbus Area Writing Project as we explore Teacher Leadership in Teaching Digital Writing. Over the course of the semester, we are meeting 3 different weekends face to face. 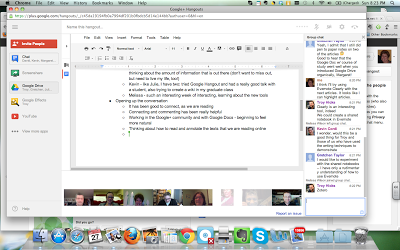 In addition, we "hang out" on Google+ once a week for an hour and communicate via a Google+ community. I've been reluctant to investigate Google+. Time is precious and I already feel like there isn't enough of it. I have a tendency to want to know it all and do it all, and unfortunately, I'm learning I can't. However, I've quickly become a fan of Google+ and I'm sure I've only dipped into a very small part of everything it has to offer. I know I have to be patient with the learning curve as I delve into some new tools and think about how I can use them. To begin with, we have a Google community where we can discuss articles, share our thinking, ask questions, or post resources we've found. That has been powerful this week. All 8 of us are reading the same articles, all 8 of us are commenting, and all 8 of us are learning from each other. What great professional development this is. As opposed to all of us reading common articles and getting together a week or two later to discuss it in person, we've each been able to have access to others' thinking whenever it's been convenient. We just log on to our Google+ community, and everything is right there. I had time to mull over others' responses and had many "aha" moments as well as I considered other points of view. Tonight we met on Google Hangout. All 8 of us in different parts of Columbus (or Michigan), gathered to discuss our readings and our goals for this class. 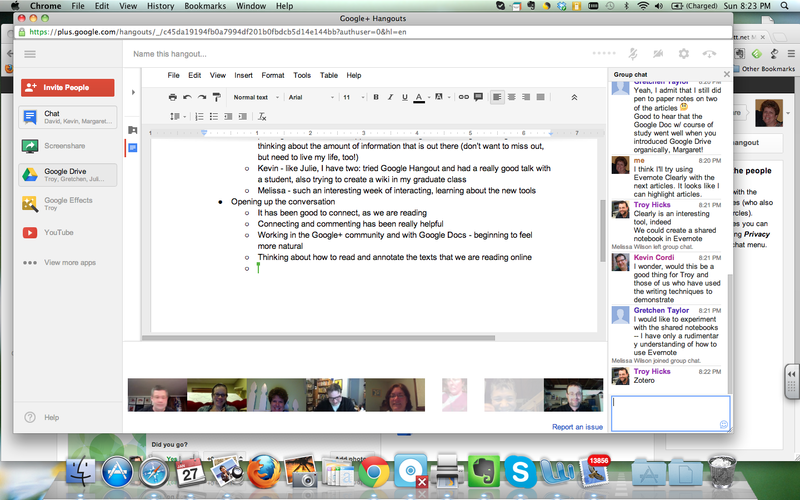 As we talked, Troy was able to keep notes of our conversation on a shared Google doc that we could all see. In addition, we had the capability to share our screen, have a side bar chat, and watch YouTube videos. If you're feeling silly, there is even an option to add a pirate hat or crown to your face showing on the screen. 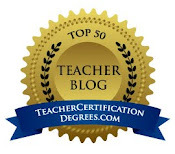 This class is giving me lots to think about as a classroom teacher as well as a teacher leader helping other teachers venture into new territories. I'm thinking of ways to use some of these tools with my fourth graders as they read collaboratively or using Google hangouts to invite authors or guest speakers to talk to my classroom. The possibilities are endless! From the time our children are little, we teach them to not interrupt. We tell them it's rude and disrespectful. We remind them of the importance of waiting. I distinctly remember my children clamoring for my attention every time I was on the phone. (Ok...my husband was a little guilty too). The dictionary defines interruption as something that causes something to break off or a disturbance. The word often has negative connotations. We don't like being interrupted and if you're a teacher, you know that it happens a lot in the classroom as 25 or more students need your attention. However, sometimes, as I've learned over the last few days, an interruption can be a gift. Some health health issues that I had been powering through for the last month brought me to a complete halt last week. A trip to the ER at 2:00 in the afternoon on a school day that turned into a 2 1/2 day hospital stay put things in perspective for me. A colleague and friend sent me an email welcoming me home on Sunday. Her last lines were..."Relax. 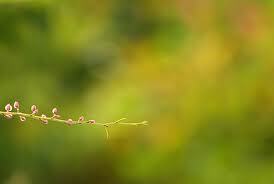 Sometimes we have to just sit back and try to appreciate life's interruptions." Boy, does she ever know me. I'm not very good at sitting back and doing nothing. But for the last 5 days, that's all I've been able to do. Right now, taking a shower requires a nap afterwards. I know that I have a great husband and wonderful kids, and they proved me right once again. Zach and Molly, both in their early 20s, took care of life at home, so Keith could be with me. It's been very rewarding to sit back and watch my children (who used to interrupt me when I was on the phone), be everything I hoped they would be and more. Same goes with my friends and extended family. Homemade vegetable soup was at my door 30 minutes after I got home. Visits, phone calls, texts...I feel very loved. Today, a teacher friend brought lunch. Now, how often does a teacher get to have a leisurely lunch with a friend on a Tuesday afternoon? In the middle of January? These people feed my soul. The outpouring of love and help from the people at my school. I couldn't ask for a better group. They've done everything from covering my class at 2:00 in the afternoon, to pulling together lesson plans for the sub who did not hesitate to jump in and help me. I know that my kids are in very capable hands. The secretaries have bent over backwards making sure my class is covered and my principal has been nothing but supportive. The importance of expertise...I am so thankful for the competent and caring medical staff that took care of me. Time...I have the gift of time right now... time to read, time to reflect, time to write. I've read 2 great books that I can't wait to get into kids' hands (more about that in a later post). I joked with my husband that it is a good thing that online ordering was not available when I was on bedrest 20 years ago. Several books are newly downloaded to my iPad and I'm expecting a few Amazon boxes from the mailman. I have peace in my heart right now. I'm honoring my body's limitations and finding out that the world will go on successfully, even if I take a little break from the madness. It's so easy for me to get caught up in what I need to do next at school and at home, that I forget the importance of stillness. So, for today, I am thankful for this life interruption. It won't be long until I'm back to my normal routine. But, I hope that I won't forget the importance of being quiet, taking time for friends and family, and honoring my limits. I've learned that this little blip in my life has not left me weaker, but much stronger. Thank you Debbie for that reminder. Thanks to Ruth and Stacey for hosting Slice of Life Tuesday. 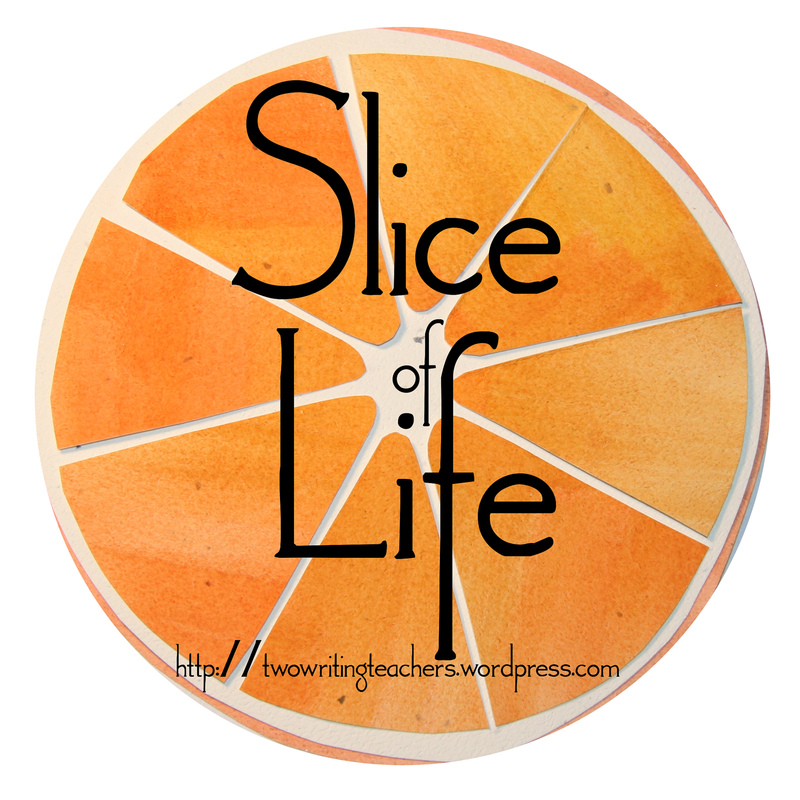 Check their blog for other slices. It's that time of year again to not only reflect, but to look forward. Last year, I read about One Little Word from Stacey and Ruth at Two Writing Teachers and shared it with my third graders. I plan to do the same with my fourth graders on Thursday. Last year, my word was balance. I think I did a pretty good job. I changed some things that I wanted to change, but there is still work to do. This year my word is reach. I will reach inside myself and find time for quiet and understanding. I will spend time each day feeding my soul through reading, writing, yoga, walks, and hot cups of tea. I will reach out to find joy in each day, especially those days that are wrought with hurriedness, busyness, and chaos. How can I not find joy when I spend my days with 29 inquisitive kids who still love to learn? I will reach out to friends and family, making sure they know how important they are to me. In the same way, I will reach out to strangers, finding ways to extend kindness and graciousness. I will stretch myself as I reach for new knowledge. I'm looking forward to some wonderful learning opportunities through my studies at OSU and with the Columbus Area Writing Project. It's important to me that I continue to learn from others in all facets of my life, not just my professional life. Finally, I will reach for acceptance, acceptance that I can't do it all and that's OK. I will give myself a break from perfection, and striving to know it all, do it all, and be all. I will let myself struggle with new things and take myself a little less seriously. I will work towards continuing to grow into the best person I can be, for we are never really done are we?